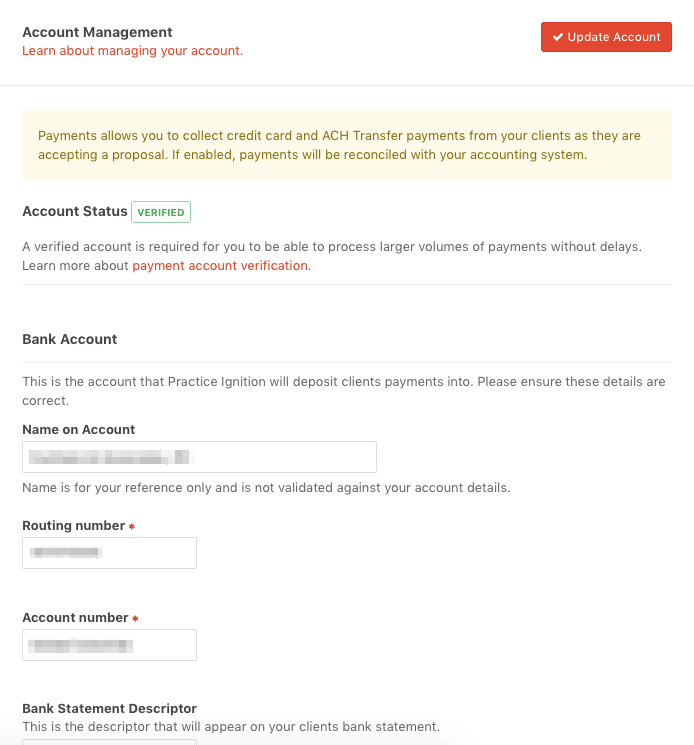 The payments feature in Practice Ignition allows you to collect ACH or Credit Card payments from your clients, in line with the service pricing and billing types defined in your proposal. If you have Xero or QuickBooks Online integrated with your Practice Ignition account, it will also automatically reconcile the payments against your invoices, creating a complete end to end solution for your on-boarding process! Note: To use our payments feature, your business must have a bank account. You also must have an active Practice Ignition subscription, so if you are on trial, you need to activate your account first by going to the billing tab in settings and entering your billing details. If this is your first time to use Practice Ignition, you can enable payments by going to Settings > Payment Gateway. Just click the Enable Payments button to activate. You will need to provide your bank details and other info for identification. Click the Edit Details button on the right to open the slider. Here, you are required to complete the fields marked with red asterisks. Important: You must verify your details in the Account Management section in order to receive the funds that we collect from your clients. Payments can still be processed before this step is completed but you will not have access to the funds. Check out this article to learn more about verifying your payment account. Here you can select what payment types you want to offer your client - either Direct Debit/ACH (US Only) or Credit card, or both. This selection is for all clients. You also have the option to make payments a 'Requirement' on all newly created proposals, so when you send a proposal to a client, they will have to enter their payment details before they can accept the proposal. This can also be switched off when creating/editing the proposal. The number you enter here is the number of days after the invoice is created that payment is deducted from your client. Entering immediately means that payment will be collected as soon as the invoice is generated. The Upfront Payment Collection Terms apply to any invoices that are generated upfront on acceptance or are Billed on Completion (including estimates). Recurring Payment Collection terms apply to any invoices that are created on a monthly recurring basis. In the below example, if I had my recurring invoices set to go out on the first of every month then payment would be deducted 14 days later on the 15th of every month. For information on how to use payments in your proposals, see our article here.